When you are designing your infrastructure to be ready for disaster recovery, network planning becomes one of the most important aspects. If you’re using a public cloud such as Azure as a disaster recovery target and the amount of data you wish to replicate is high, optimizing this bandwidth would be very beneficial. 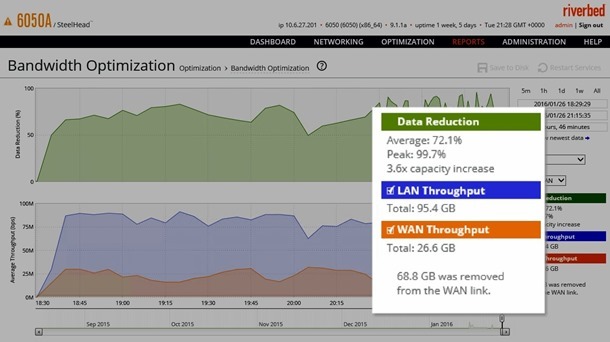 You can use a WAN Optimizer like Riverbed to optimize the replication traffic going to Azure. About a year ago, we partnered with the folks at Riverbed to publish a whitepaper to show the optimization of replication traffic sent from Hyper-V to Azure. We partnered with them again to look at the benefits that can be achieved when replicating VMware virtual machines or Physical servers. Kevin Sullivan and myself from Microsoft along with Brett Hill from Riverbed participated in this study. We found that Riverbed® SteelHead™ appliance reduced the amount of data transferred by more than 70%. Time taken for replication was reduced by more than half. Download the whitepaper to get more details about experiment and how to set it up end-to-end. For more information about how to set up Azure Site Recovery, check out the Azure Site Recovery documentation. Getting started with Azure Site Recovery is easy. Simply sign up for a free Microsoft Azure trial. If you have any feedback or features you'd like to see in ASR, send them our way on the Azure Site Recovery Feedback Forum. Visit the Azure Site Recovery forum on MSDN for additional information and to engage with other customers.